After working with the Adafruit Wave Shield, I wanted something a bit more compact. 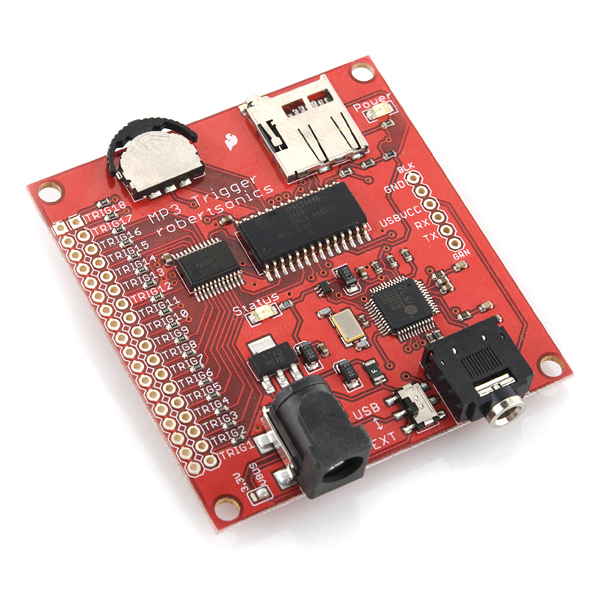 Enter the Sparkfun MP3 Trigger v2.0, which uses a VS1063A codec chip. After testing the basic switch open/close triggers, I wired this to an PIR (infrared) trigger and simple switch. The PIR is a bit finicky, and couple probably be improved with some code adjustments. PIRs also have a tendency to be less reliable in bright light, so the lights on my bench may have interfered somewhat. This board can play sounds/tracks in a particular order or randomly. It doesn’t technically need an Arduino unless you want to incorporate more intelligent sensing capabilities. Here’s a look at some demos using songs from my first album, Mandala, as well as some sound effects. I’m using 193 kbps MP3 files. 2015 Update – This is a nice little board. It has since been replaced by a new version. See my other reviews and tests of similar boards.